Hello Refashion Co-op. 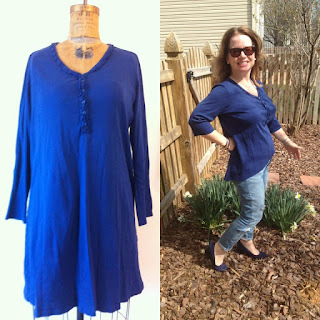 I have a quick no sewing refashion for you. I had this night shirt. It was in great shape and I like this shade of blue. I don't really like night shirts, so it needed to be refashioned into something else. I decided to make it a shirt and use it's length to make it long in the back and shorter in the front. It is basically a T shirt so I spread it flat and started cutting. I made the sleeves shorter too. It is more versatile than I imagined. For more pictures and details click here. I never wear night shirts either. They always end up bunched up around my waist. Your new shirt looks much more functional and comfortable though. Kudos! Thanks a lot Ladies. Happy sewing to both of you!